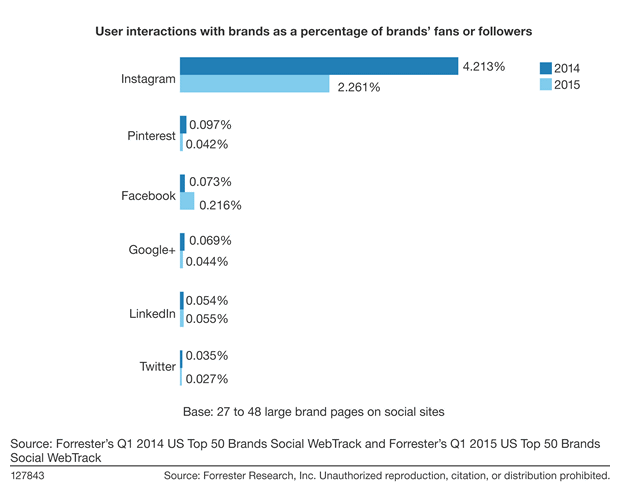 When it comes to social media user interactions with brand accounts Instagram sits alone at the top of the mountain. Instagram brand accounts get 1100% more user interactions than Facebook, which ranks number two for most user interactions. That is why every small business is desperately trying to figure out how to use Instagram. I have seen many businesses and thought leaders build up a nice following that consistently likes their picture posts. However, I have yet to come across anyone that has found a way to get those followers to visit their website. Facebook, Twitter, Pinterest, and LinkedIn all make it real easy to post a link on an update or in a message. Instagram does not allow links, unless you are willing to pay for ads. Because of this, I knew that there was a goldmine of customers just waiting for the person that could figure out a creative solution to this big problem. Drive organic Instagram traffic to a website. My final perfected system was also able to target a specific audience, turn them into followers, and create real conversations with my followers. 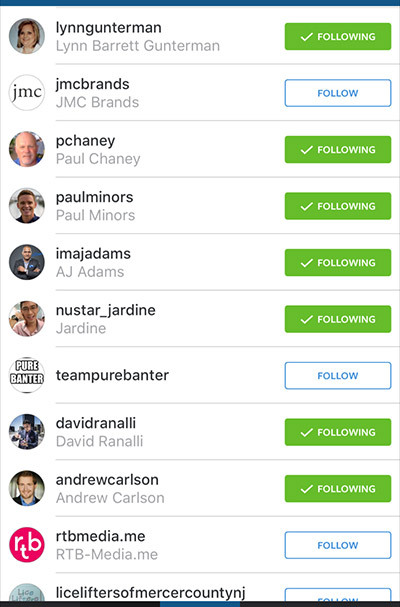 Today, I am going to share my entire Instagram growth hacking strategy, from soup to nuts. It starts with the optimization of your profile page, and it ends with a direct messaging tactic that will blow you away. The profile page is an extremely important part of the social media marketing plan for every single social channel. With Instagram, it plays an even bigger role than any other social site. Facebook, Twitter, and LinkedIn all allow you to share active links to your posts and pages via updates. When you post a link on Instagram, it is just a long piece of text. This means that the primary goal of an Instagram marketing plan is to get your followers to visit your profile page, which is the only place where you are allowed to have a live link. There are five areas you need to optimize to make your profile stand out above the rest. I am going to walk you through how to get the most out of each one. Most of you probably have a username already that you are committed to. If you do not, then there are two best practices when it comes to choosing a good username. I chose this path because I am trying to get more listeners to my podcast with my Instagram account. 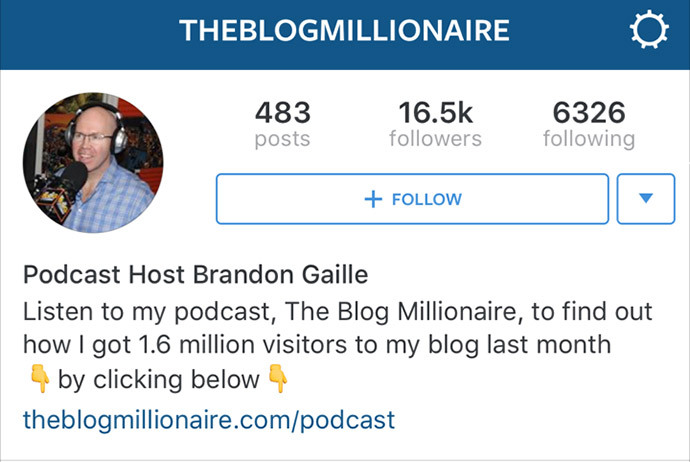 My podcast, The Blog Millionaire, has a pretty catchy name and it does a good job of attracting my target audience. The most common mistake Instagram users make when selecting a username is choosing one that is not your name and has nothing to do with your brand. If your target audience is stay at home moms and your username is FreakyGirl87, then you are not going to have a chance. Your username is different from your name. Instagram allows you plenty of characters for your name, and you should take advantage of this. For your name, I suggest adding one or two extra descriptive words to your own name. As I mentioned before, I am trying to get as much exposure for my podcast as possible. I am reaching out to hundreds of people each week on Instagram. By using a nice targeting process, I am able to make sure that all of the people that I am engaging with either love podcasts or have a podcast of their own. This is why I added “Podcast Host” before my name. This plays a huge role in getting people to follow me back and to check out my profile. The one place that you are going to get the most visibility will be in the followers section of the accounts that you follow. People check to see who followed their account on a regular basis. In the followers feed, my profile jumps out because it says “Podcast Host Brandon Gaille” as opposed to just Brandon Gaille. My name is just another name in the feed. Since everyone that I follow loves podcasts or is a podcast host, this makes an instant psychological connection with every person that sees my profile in their followers feed. This equates to more follows, profile views, and podcast episode downloads. The two most common mistakes to avoid when choosing your Instagram name are.. Using Your Username as Your Name – The only time this works is when the Instagram account is that of a major brand that is pulling in $10 million in yearly revenue. Starbucks falls into this category. Only Using Your First Name – When you use your first and last name you instantly convey trust between you and potential followers. Just using your first name says that you do not really want people on Instagram to know who you are. Here are a few examples of how to use a descriptive word paired with a name. If you can not come up with a good descriptive word, then just use your first and last name. Instagram is all about images, and that is why your profile image needs to be optimized to essentially say “hello” to anyone that comes across your account. This is accomplished online by showing everyone a nice picture of your smiling face. I have talked about this before in past episodes of my podcast, so I will not go too deep into detail here. The basic elements of a great profile picture that has been proven inspire competence, likeability, and influence are… wearing eyeglasses, having an eye squinching smile that shows your teeth, and being dressed in a nice professional shirt or blouse. A good profile picture should convey competence, influence, and likeability. There was a recent study by PhotoFeeler that looked at what elements created the ideal photo for social media profiles. The study analyzed over 60,000 ratings of perceived competence, likability, and influence. People wearing eyeglasses were seen as more competent and likable. The squinched eyes are perceived as someone that portrays comfort and confidence. Big smiles are comforting and tap into a wealth of postive emotions. The open mouthed smile had the largest impact on likability of any feature that was rated. In contrast, the closed mouth smile had only half of the impact on likability and did not have any positive effect on competence and influence. So always remember to show your teeth every chance you can get. There was a significant positive impact on perceived competence and influence on male profiles that wore a jacket and tie. The more conservative looks vastly outperformed the trendy or unusual colors. For women, wear a nice blouse in a classic color. Also, go conservative with the jewelry. Dark photos had a significant negative impact on likability. When you take your picture make sure that you have great lighting. Natural light performs the best. One more tip to always remember is to have your picture focus in on your face. Your profile picture is going to be small, and very small, when people see it on a smart phone. If you take it from the waist up, then no one will be able to see your face. I chose a picture of me in front of my microphone with a headset on. This is essentially the visual trademark of a serious podcaster, which every other podcaster will be able to quickly identify with. I am also wearing glasses, with an open mouthed eye squinching smile, and I have a nice button down shirt on. At the end of the day, you should do your best to balance incorporating these tips with your own personality. Instagram allows you to have up to 150 characters in your bio, and you want to make every single one of them count. The goal of your bio should be to explain why they should click on your link. My bio reads.. I start with a simple call-to-action that reads… “Listen to my podcast, The Blog Millionaire.” You always want to be direct as possible with your call-to-action. Then I add social proof by saying, “to find out how I got 2 million visitors to my blog last month.” This let’s them know why they need to listen. Finally, I directly ask them to click with the statement, “by clicking below.” On top of this, I added a downward pointing finger on each side of the words, “by clicking below.” The fingers are strategically positioned to point directly at the link on my Instagram profile. Here’s how it looks on Instagram. We must always remember that every person that clicks on your Instagram profile link will be using a smart phone or tablet. This is why it is important to review how your link looks on a smartphone and a tablet before placing it on your Instagram profile. I use a link to my iTunes podcast feed. For anyone using an iPhone or iPad, they will be taken directly to the podcast app where they will be able to download my podcast episodes. Now I realize that the iTunes link is not going to show up well for anyone that is using an Android device. Before I made the decision on going with this link, I looked at which platform was delivering the most downloads. ITunes was responsible for over 80 percent of total episode downloads, and that is why I went with the iTunes link. The ideal situation is to have a link that goes to a page that shows up well on both Android and Apple devices. The three most common linkable assets that work best on Instagram are.. The Lead Magnet – This is where you offer a cheat sheet or secret sauce that would be beneficial to your target audience. After the click, they are taken to a mobile optimized landing page, which asks for their name and email address to get access to the goods. Pillar Content – Most companies will have several pieces of top notch content that are designed to position them as the expert within their field. For example, I have a 3000 word post that breaks down the four key tactics that I used to build my blog traffic to over one million visitors. At the end of the post, I have a call-to-action to find out more about my online blogging course. The Lead Capture – This works best when it is paired with a free consultation. You promote the free consult in your bio, and the clicks are sent to a page that offers more social proof along with a lead capture form. Here is what my entire profile looks like. One of the biggest mistakes that people and businesses make on Instagram is focusing too much on their total followers number. While this number is a metric that you will want to keep track of, it is not the most important metric. For me the most important metric, is the number of direct message conversations I have with my followers. This is why I only follow certain types of profiles, and I never use any type of auto following software. If you listened to my Twitter marketing hack episode, then you will see some similarities in my process for identifying my target audience on Instagram. 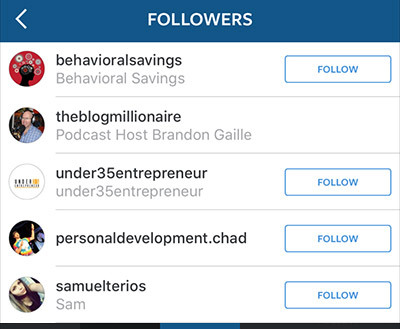 Just like with Twitter, the engagement on Instagram starts with following other people. Before you begin following other accounts, you need to do some research to identify other Instagram accounts that have a similar audience to yours. Most of you will already know some of the big thought leaders within your industry. My audience is made up of entrepreneurs that are wanting to get more traffic to their websites. Since I am specifically promoting my podcast, I narrowed my search down further by trying to find podcast hosts on Instagram that had an audience made up of entrepreneurs. 5000+ Followers – Most accounts with less than 5000 followers were not actively using and building their Instagram following. Even on the occasion of finding one that did, it really did not fit into the growth hack. Any good growth hack works on a system. An account with 800 followers will only last for a couple of weeks. The Instagram accounts with more than 5,000 followers are always gaining new followers on a daily basis. This will allow you to work through these accounts for many months to come. Less than 50,000 Followers – While being to small offers too little of an audience to work with, the accounts with over 50,000 followers are usually plagued by an audience that is too broad. The sweet spot for finding an ultra targeted and highly engaged audience are the accounts that have between 5,000 and 50,000 followers. A Good Followers to Following Ratio – A 5 to 1 followers to following ratio is a sign that most of their followers are organic. That means if you find an account with 10,000 followers, then it should be following less than 2,000 other Instagram accounts. The Instagram users that tend to convert to paying customers and clients are typically organic followers. Real Followers – A quick scan through the first 100 followers will allow you to identify if the profile bought their followers. Look for generic pictures and names that look like they were generated by a computer program. You will quickly see a trend once you start clicking into fake Instagram accounts that were used to pump up the followers number. They will all have 5 to 10 generic posts and will be following 200 to 300 people with only a couple of followers of their own. The last thing you want to do is to spend all of your time following fake profiles, so be sure to include this step in your due diligence. Once I completed this process for myself, I was left with 17 accounts that met all of my standards. One of these accounts, was the profile of John Lee Dumas. 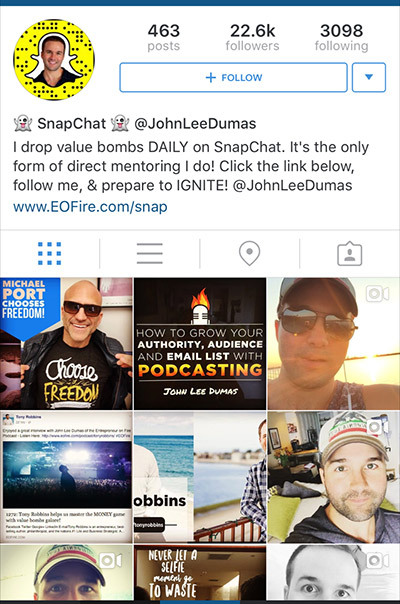 Since I listen to John’s show EOFire on daily basis, I knew that his audience was exactly what I was looking for. Everyone that follows JLD is an entrepreneur that loves listening to podcasts. At the time when I first started engaging his followers, he had 22,600 followers and was following 3000. This was a nice 7 to 1 ratio, and he fell right into the 5,000 to 50,000 followers sweet spot. Today, his Instagram account is followed by over 31,000 other accounts. Even as I continue to engage thousands of his followers, his account continues to add hundreds of new followers every single week. It is important that you take your time in identifying the accounts that you will focus your efforts on. This is one area where you want to dig one inch wide and one mile deep. The deeper you dig, the more money this growth hack will make you. And one more thing about identifying accounts… This is not a one time process. You should always be on the lookout for new Instagram accounts that might be better than one of the ones on your current rotation. Since I started using this growth hack eighteen months ago, I have replaced nine out of the seventeen accounts I started with. Identifying the accounts is the first step in the targeting process. The next step occurs when you click into their followers and make decisions based upon the information that is given to you on each person. Over the last year, I have compiled some interesting analytics from the Instagram tests that I have run. In regards to people following me back, here are the percentage of total follow backs that I received when I followed 300 profiles of each type.. The takeaway is that you only want to follow real people with pictures of real people. This is what will give you real results. Below you can see a screenshot of the profiles I chose to follow and not follow. With the profile picture findings, it allowed me to create a simple process for visually identifying profiles to follow. Because it is a pure visual process, it takes less than a second to quickly follow a profile that has the greatest chance of producing true engagement. As I mentioned earlier, I focus my following efforts on 17 different Instagram accounts that meet all of the requirements and have a similar audience to mine. Everyday each of these accounts are getting brand new followers. The new followers are always listed first when you click to see the list of an account’s followers. These followers are going to give you your biggest return on following you back, direct messaging you, and eventually turning into paying customers. The reason for this is three fold.. They Are Currently Active on Instagram – Instagram users go through active and inactive phases. If you started following people that followed an account three months ago, then they may or may not still be active on Instagram. They Just Hit the Follow Button – When someone gets excited about following someone new, this excitement can carry over to follow multiple accounts. This is why Instagram and Twitter are constantly giving you new suggestions on who to follow. They Are Wanting More Information on a Specific Topic – By following people that just followed Rick Mulready, the Facebook Ads expert, you know exactly what problem these people are having right now. If you offer a Facebook Ad course, then you are able to engage with Instagram users that are ripe and ready to sign up to your course. I follow between 30 to 60 new accounts per day. The 17 accounts that I target receive a combined 150 new followers every day. This means that every person I follow has followed an Instagram account with a similar audience to mine within the last twenty four hours. I rotate completely through all 17 accounts every three days, and then start over from the top again and again. Just like with Twitter, you are going to have to know what the following limits are. There are two types of limits that you need to know; hourly and total. Instagram allows you to follow up to 165 accounts per sixty minute period. You will notice you hit the limit when you hit the follow button and it nothing happens. With that being said, you should never try to follow the maximum amount. You are not shooting random birds out of the sky with a shotgun. You are a sniper that is only firing when you see the bird that fits your exact requirements. Stagger Your Daily Following Between 30 to 60 – Instagram uses computer algorithms to identify users that are engaging in suspicious behavior. Even though I never use any type of automation software to follow users, I still want to stay away from leaving a footprint that might raise a red flag. Here are the daily follows I made from last week. Monday – 32. Tuesday – 47. Wednesday – 39. Thursday – 33. Friday – 54. Stagger Your Following Throughout the Day – I break up my following in the morning, afternoon, and evening. If I were to follow 36 people on Tuesday, then I might follow 11 in the morning, 15 in the afternoon, and 10 in the evening. This may sound complicated, but it really is not. The best practice is to follow people on your phone during down times. This will allow you to run the entire growth hack without taking away a single minute from your normal business hours. I need to take a breather between my sets during workouts. I am waiting anywhere for anything. From Chick-fil-a to commercials, there are always many moments in my day like this. I am soaking my muscles in a dead sea salt bath. Just make sure you have a water proof case to protect your phone. At some point, you are going to be tempted to follow more people each day. Do not give in to this temptation. When done correctly, this growth hack is the Goose that lays the golden eggs. If you get greedy by doubling the amount of people you should follow, then Instagram will shut down your account. Instagram has a hard account limit that is set to 7500 follows. Once you have followed 7500 people, you will be left with two choices that will allow you to continue following. This is the most common tactic used. You just go into your account and start unfollowing every person that did not follow you back. Instagram has an hourly unfollow limit of 60. It is also a good practice to limit unfollow people using the same staggered approach with following new accounts. I use an app called CrowdFire to manually complete my unfollows. 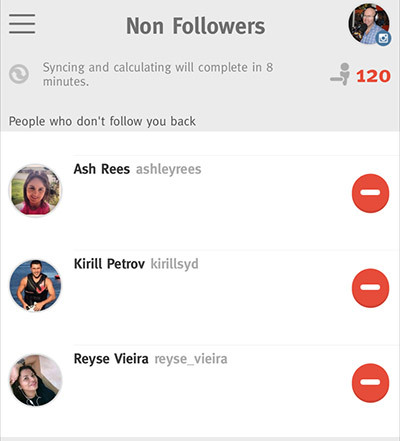 The app sorts all the people that have not followed you back into a section called “non followers.” This allows you to quickly identify non followers, without having to worry about unfollowing people that are currently following your Instagram account. For those of you that are a husband and wife team, then you can use two accounts with the same call-to-action and system. If you have employees and get their permission, then you can apply the same tactic using accounts for different employees. If you average 50 new follows per day, then it will take you five months to max out with your follows. I recommend preening the people that did not follow you back once a month. Although there are plenty of gray hat Instagram following strategies, most of them are completely focused on increasing your followers numbers. My growth hack is a white hat strategy that has the goal of achieving real engagement with your customer avatar. Instagram revealed that 25% of their users have used the direct message function. This is a misleading stat because I am guessing most of these people only used it one time. Over a three year span, the number of initiated direct messages that I have received to my personal or business Instagram account has been a grand total of 19. This also includes the fact that I am following about 60 new accounts per day. The bottom line is that the majority of Instagram users are not actively sending out direct messages to their followers. Businesses, specifically, are ignoring it altogether. The main reason behind this is the fact that links to websites are not active in direct messages. If you could click on a website link in a DM, then I am guessing the flood gates would open. For someone to go to a url that you sent them in a direct message, they would have to copy the url, leave Instagram, open a web browser, and then paste the url into the browser. This many steps would even kill the engagement rate on a desktop computer. The reality is that every step would have to occur on a cell phone, which is never going to happen. The good news is that I created a way to drive traffic to your linkable asset via Instagram direct messages. The easiest way to explain this is by looking at some of the direct messages that I have sent my new followers in the past. This works well when you are dedicating your following and engagement to a single account. Instead of rotating different accounts each day, you would follow people from a single account for a month. This works best on the larger accounts that have closer to 50,000 followers and are consistently adding 40 to 100 new followers each day. For example, I spent 45 days following the followers of John Lee Dumas. During that 45 day period, my new followers would receive this direct message from me. Let’s go ahead and break down this direct message style. 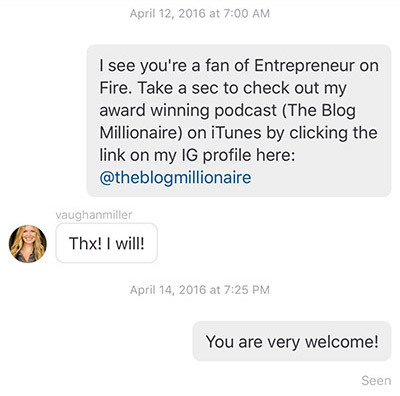 #1 The Common Thread – Since I am currently following people that follow John Lee Dumas, I start off the DM with “I see that you’re a fan of Entrepreneur on Fire.” This allows me to make an instant connection within the first nine words of the message. This part of the message will change everytime I begin following another person’s followers. The first 36 characters of the message will show up in their inbox preview, so it is important that you use that real estate to make a connection. This will drive them to open your DM and read the entire message. #2 Call-to-Action and #3 Social Proof – After my common thread sentence, I move into my call-to-action by saying, “take a sec to check out my award winning podcast (The Blog Millionaire) on iTunes.” My social proof is a simple mention of “award winning.” There is a 200 character limit with direct messages, and you have to use your words wisely. #4 Explaining How to Get to the Link – The next part of the message explains how to find the link through stating, “by clicking the link on my IG profile here.” This is the piece that ties all of it together. #5 The Link to Your Profile – The only two types of text that are linkable on Instagram are hashtags and profiles. Paired with the explanation, this makes a seamless two click process to get to your website. This is what I use when rotating through multiple accounts each week, and it is the current direct message that I send to new followers. #1 The Engagement Question – Over the last 18 months, I have tested many variations of questions to use with this direct message. The “what’s your website” variation easily outperformed all of the others. When someone asks me for the url to my blog, I always respond right away. This is a question that will work for anyone that is in the business to business space. I add a personal tone to the “what’s your website” question by adding “so that I can take a quick look at what you are doing?” By making it personal, I was able to double the amount of direct message responses. #2 Soft Ask – After my question, I immediately follow it up with, “If you have the time.” The soft ask after the engagement question psychologically disarms anyone that reads the direct message. I showed a genuine interest in what they are doing with their website, and I let them know to only worry about doing something for me if they had some extra time available. #5 The Link to Your Profile – The direct message ends with the link to my profile @theblogmillionaire. As you can see, both styles of direct messages end with a call-to-action, how to get the link, and the link to my Instagram profile. You can make your own adjustments to the front end of the formula, but be sure keep the tail end the same. 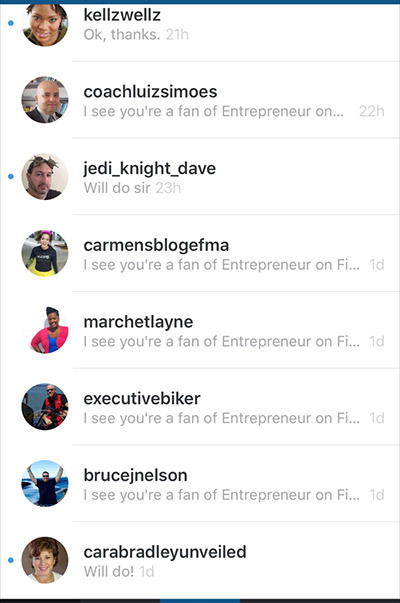 Combined with the fact that there are very few businesses using Instagram direct messages and the fact that none of them are using my formula, this makes the engagement off the chart. Now that you have the initial direct messaging down, you can begin engaging with everyone that is responding to your initial message. I usually go into my Instagram inbox two to three times a day to respond to all my new messages. My response rate for my initial message using style 1, with the Entrepreneur on Fire intro is right at 20%. This is pretty amazing for a direct message that does not include a question. I am not a fast mobile text typist, so I use the audio to text function on my phone to write my responses. This allows me to just lay down on my couch and casually respond to everyone. I am already a listener. You are very welcome. I hope you are having a fantastic week. Thank you for taking the time to check out my podcast. Have a wonderful day! Thank you for listening to my podcast. I will continue trying to deliver great episodes in the weeks to come. For style two… I choose two direct message response patterns depending upon if I have a busy day or have plenty of extra time to spare. On a busy day when a new follower responds with their website url, I use a pre-defined closed loop pattern. I will take a look at their website. After that, I will respond with a compliment and a link to one of my blog posts that I believe will give them the best guidance. Here is a direct message conversation where I use the closed looped pattern. #1 The Compliment – I always start with a compliment, like “Looks great!” No matter where someone is in their blogging journey, they can always use encouragement. This phrase also let’s them know that you took the time to look over their website. #2 The Recommendation with Social Proof – After the compliment, I get specific with this phrase by stating that, “there were four things I did.” Then I drop in the social proof with the line, “that helped me get my first one million visitors.” These two paired together prime my new followers to click on the call-to-action. #3 The Call-to-Action – While the initial direct message used the Instagram profile link to promote my podcast, the closed loop call-to-action uses a website link. At this point, the new follower knows that I took the time to look at their website and give them a recommendation. The psychology law of reciprocity will compel them to take the time to type in the url into their web browser. For the url, I use a short link with a number, the blogmillionaire.com/32. This limits the number of characters they need to type out. When I have more time available I will personalize each of the closed loop messages. While I am looking through their blog, I pick out the one post that really shines above the rest. Then I let them know how much I loved it. This allows me to get real specific using the same closed loop response formula. The power of Instagram direct messaging is the fact that it is still pure and devoid of all push marketers. It is real similar to the first couple of years of email. I still remember checking my email and hoping that I would get an email from anyone. Back in those days I opened and clicked everything. #1 Make Your Profile Stand Out in the Feed – Use your real name with a descriptive word before it to identify your expertise, and choose a close up pic of your smiling face. #2 Create a Bio with a Call-to-Action that Leads to an Optimized Linkable Asset – The most common links are to lead magnets, pillar content, lead captures, and podcasts. #3 Identify Accounts that Have a Similar Audience to Yours – Eliminate any accounts that do not have 5000+ followers, a 5 to 1 followers to following ratio, or have fake followers. #4 Only Follow Real People with Profile Pictures of Real People – Profiles pics that have a close up of a person’s face will have the highest engagement ratio. #5 Know Your Follow Limits – I recommend following 30 to 60 accounts per day using a staggered approach. #6 Know Your Unfollow Limits – Never unfollow more than 60 a day. #8 Respond to Direct Message Replies Two Times a Day – Use the audio to text feature on your phone to cut your typing time in half. I think you will find that once you set up your profile and your initial direct message funnel, that it pretty much runs itself. It really just requires you to actually spend time having genuine conversations with your audience on a daily basis. These simple conversations will lead to real connections that turn into lifetime customers. For a limited time, I am giving away my Social Media Growth Hacks course to anyone that signs up to The Blog Millionaire course. It includes all of my proven growth hacks for Pinterest, YouTube, Instagram, Facebook, and Twitter. The Pinterest growth hack alone drives over 250,000 visitors to my blog every single month. After you watch my latest webinar here, you will be able to get my Social Media Growth Hacks course as a free bonus when you sign up to The Blog Millionaire.